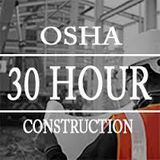 This course covers OSHA policies, procedures, and standards for the construction industry as well as safety and health principles. Course materials include a copy of the latest OSHA Standards 29 CFR Part 1926 and extensive reference materials. Students will receive a Federal OSHA card and 30 hours credit toward the Manager of Environmental Safety and Health Certificate (MESH).